Alzheimer's disease (AD) is the most common cause of dementia; it currently affects 1 in 8 older individuals in North America . Ever since it was described around the 1900s by Alois_Alzheimer and Emil_Kraepelin, significant efforts have been made in order to cure this disease or to at least be able to treat it. Such efforts include the development of animal and cellular models, which have been attained by using diverse genetic modifications in order to mimic the spectrum of symptoms and with the purpose of gaining some insights on the disease. It is because of the use of these models that scientists have been able define critical disease-related mechanisms, and evaluate new treatments. Transgenic mouse models of AD have been created to express the major pathological hallmarks of the disease, more specifically the amyloid_plaques , the neurofibrillary_tangles  and the substantial neurodegeneration  observed in patients. However, our understanding of Alzheimer’s disease pathogenesis is currently limited by difficulties in obtaining live neurons from patients and the inability to model the sporadic form of the disease. It may be possible to overcome these challenges by reprogramming cells from AD patients. The vast majority of these mouse models more specifically resemble the effects of Familial Alzheimer's Disease (FAD) mutations. 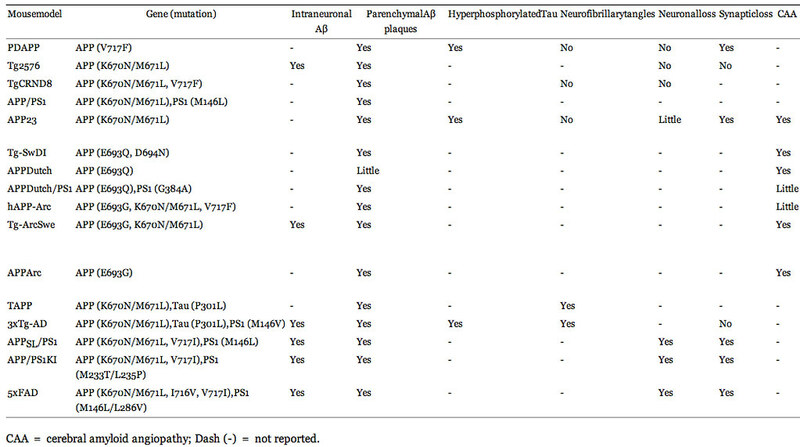 Given the genetic complexity of AD, these include single, double, and triple transgenic mice that are able to express various disease-associated mutant forms of human amyloid_precursor_protein (APP), presenilin_1 (PS1), presenilin_2 (PS2), or tau. 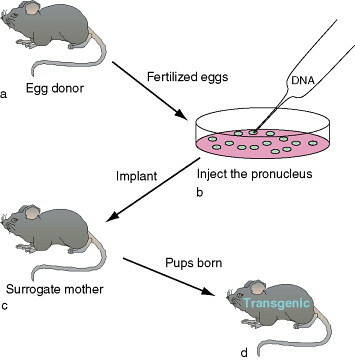 Transgenic mice have been able to recapitulate many, although not all, of the key features of AD at a behavioral and cellular level, and have been widely used in research for drug testing, treatment, and diagnostic purposes. Figure 2. (a) Overexpression of mutant human APP in transgenic mice causes amyloid deposition into plaques and in the walls of the blood vessels of the CNS (b) Shows how the amyloid pathology in these mice closely resembles that seen in the AD brain of patients. Adapted from Spires and Hyman, 2005. FAD mutations in APP can be demonstrated in mice by overexpressing the human mutant APP. For instance the PDAPP transgenic mice line express mutant APP in various distinctive regions of the brain like the cortex, hippocampus, hypothalamus, and cerebellum . These transgenic mice also exhibit Aβ deposition and plaques in the cortex and limbic system, which are first observed at 3 months. Additionally, they show synaptic loss, inflammation, astroglial and microglial reactivity, and age-related cognitive impairments   . However, APP mice fail to reproduce the tau pathology and more importantly they lack substantial brain atrophy that is typically seen in cases of severe AD. Nevertheless, there is another mouse model know as the 3xTg line which is created by combining mutant APP, PS1, and tau transgenes. The 3xTg mice are more appropriate to the study of AD because they develop extracellular plaques before the tangles, as is observed in human AD patients . However, these two pathologies appear to develop independently, without a causal link and this hinders the study of the underlying mechanisms. Although research on animals has contributed to our current understanding of AD, animals don't accurately reflect the features of the disease because the creation of animal models with substantial amyloid and tau pathologies, that are yet free of other confounding pathologies, remains a major obstacle in this field. Moreover, mice models are only able of reproducing the familial form of the disease, which represents approximately only 1%-6% of AD cases  and to date there are no murine models that can be used to study sporadic AD (see Alzheimer's Types), which makes up the majority of disease cases. Figure 3. (a) Overexpression of mutant human APP in transgenic mice causes amyloid deposition into plaques and in the walls of the blood vessels of the CNS (b) Shows how the amyloid pathology in these mice closely resembles that seen in the AD brain of patients. Adapted from Spires and Hyman, 2005. Currently, there are no tests or exams that can accurately show whether a person has Alzheimer's. Even though physicians have proven to be very successful in determining if a person has dementia, the difficulty relays on determining the exact cause of that dementia. Therefore, clinical diagnosis of AD remains a postmortem one and this significantly hinders the possibility of prevention and even treatment of the disease. Recent research by Cordeiro et al., 2010  has taken advantage of the visual deficits, which have long been noted in AD patients to potentially use this as a tool for earlier diagnosis as well as a way of keeping track of the progression of the disease and the effects of treatment. This study was able to demonstrate in a transgenic AD animal model how fluorescent markers that attach themselves to the relevant cells can be used as a new technique that enables retinal cells, and therefore the stage of brain cell death, to be directly measured in real time. The retina is observed using a customized laser ophthalmoscope but this equipment can be applied in clinics worldwide, and it is an inexpensive and noninvasive technique. This method consists of an optimized protocol that was initially developed by Vierbuchen et al., 2010  and it entails taking primary fibroblasts from patients with familial Alzheimer’s disease (FAD), and sporadic Alzheimer’s disease (SAD) and reprogramming them into induced pluripotent stem cells (iPSCs). Two recent studies   have examined how iPSCs can be used to model patient- specific AD pathology in vitro. In both of these studies iPSC lines have shown to differentiate into neurons that form functional synaptic contacts, exhibit normal electrophysiological activity, and express GABAergic and glutamatergic neuronal markers. Neurons differentiated from these iPSCs where shown to have higher ratios of Ab42/Ab40, which is a characteristic feature of FAD. Those iPSCs derived from the APP patients and some of the SAD patient exhibited significantly higher levels of secreted Aβ40 as compared to controls . Also, changes associated with tau were observed in some of the phenotypes, indicating that iPSCs could be particularly useful for studying the true relationship between Aβ and tau in the development of AD. However, it is important to point out that the amount of neurons for each assay was relatively small and the process is very lengthy. Larger numbers of samples will be needed to understand altogether the different phenotypes of SAD in future studies. Groundbreaking laboratories are now looking into using human skin cells to create functional neurons. This has already been successfully accomplished by a group of researchers in Columbia University Medical Center, who were able to directly convert adult human fibroblasts to display a neuronal phenotype, and which they now call human-induced neuronal (hiN) cells . By using a combination of transcriotion factors such as Myt1l and other support factors, their study shows how human skin cells can become forebrain neurons without the need of [wikipedia: stem cells]. This direct conversion of cells method takes less time, is simpler because it requires cells that are easily obtained, and has a much higher reproduction rate. Qiang and collegues  were able to achieve about a 65% conversion efficiency (which is much higher than the one achieved with iPS cell technology) . of those cells that were successfully converted, about 85% of them contained the neuronal marker MAP2, and displayed morphological, electrophysiological, and gene expression profiles that resemble regular neurons. Furthermore, hiN cells display a forebrain glutamatergic neuron phenotype, and typical neuronal Na+, K+, and Ca2+ channel properties. To demonstrate that hiN cells can integrate into neuronal circuitry in vitro and in vivo, the researchers transferred the cells into embryonic mouse brains and examined them at day seven after the mice were born. They found that the neurons were capable of sending and receiving signals in both the CNS of mice and in laboratory culture. Neurons made from skin cells of 3 people with FAD, who had mutations in either PS1 or PS2 were compared with neurons made from healthy individuals and it was observed how the cells processed and localized of amyloid precursor protein (APP). Not surprisingly, differences where detected when the hiN cells of the FAD patients exhibited an altered phenotype. Their neuronal cells had an increased concentration of amyloid beta, a greater ratio of Aβ42/Aβ40 and larger endosomes with an increased collection of APP, than did neurons from controls. Their findings suggest that at least FAD can be tightly related to abnormal endosomal function, and it also establishes hiN cells as potential tool for drug screening, cell replacement therapy and to examine human mutations in their actual environment. 1. Alzheimer’s Association. (2012). Alzheimer’s disease facts and figures. Chicago, IL: US. National Office. http://www.alz.org/alzheimers_disease_facts_and_figures.asp Accessed: March 25th, 2013 at 8:00 p.m.
2. Fraser P.E., Lévesque L., & McLachlan D.R. (1993). Biochemistry of Alzheimer's disease amyloid plaques. Clinical Biochemistry 26(5), 339 – 349. 4. Crouch P.J., Harding S.M.E., White A.R., Camakaris J., Bush A.I., & Masters C.L. (2008). Mechanisms of Aβ mediated neurodegeneration in Alzheimer's disease International Journal of Biochemistry and Cell Biology 40(2), 181 – 198. 5. Games D., Adams D., Alessandrini R., Barbour R., Borthelette P. et al., (1995). Alzheimer-type neuropathology in transgenic mice overexpressing V717F β-amyloid precursor protein. Nature 373, 523 – 527. 7. Schaeffer E.L., Figueiro M., & Gattaz W.F. (2011). Insights into Alzheimer disease pathogenesis from studies in transgenic animal models. Clinics (Sao Paulo) 66(S1), 45 – 54. 8. Lewis J., Dickson D.W., Lin W.L., Chisholm L., Corral A., Jones G., Yen S.H., Sahara N., Skipper L., Yager D., Eckman C., Hardy J., Hutton M., & McGowan E. (2001). Enhanced neurofibrillary degeneration in transgenic mice expressing mutant tau and APP. Science 293(5534), 1487 – 1491. 9. Oddo S., Caccamo A., Kitazawa M., Tseng B.P., & LaFerla F.M. (2003). Amyloid deposition precedes tangle formation in a triple transgenic model of Alzheimer’s disease. Neurobiology of Aging 24, 1063 – 1070. Horst M., Gwinn-Hardy K., Murphy M.P., Baker M., Yu X., Duff K., Hardy J., Corral A., Lin W.L., Yen S.H., Dickson D.W., Davies P., & Hutton M. (2000). Neurofibrillary tangles, amyotrophy and progressive motor disturbance in mice expressing mutant (P301L) tau protein. Nature Genetics 25(4), 402 – 405. 11. Bekris L.M., Yu C., Bird T.D., & Tsuang D.B. (2010) Genetics of Alzheimer Disease. Journal of Geriatric Psychiatry and Neurology 23(4), 213 – 227. 12. Cordeiro M.F., Guo L., Coxon K.M., Duggan J., Nizari S., E Normando E.M., Sensi S.L., Sillito A.M., Fitzke F.W., Salt T.E. & Moss S.E. (2010). Imaging multiple phases of neurodegeneration: a novel approach to assessing cell death in vivo. Cell Death and Disease. 13. Vierbuchen T., Ostermeier A., Pang ZP., Kokubu Y., Südhof T.C., Wernig M. (2010. Direct conversion of fibroblasts to functional neurons by defined factors. Nature 463(7284), 1035 – 41. 14. Israel, M.A., Yuan, S.H., Bardy, C., Reyna, S.M., Mu, Y., Herrera, C., Hefferan, M.P., Van Gorp, S., Nazor, K.L., Boscolo, F.S., et al. (2012). Probing sporadic and familial Alzheimer’s disease using induced pluripotent stem cells. Nature 482, 216 – 220. 15. Yagi, T., Ito, D., Okada, Y., Akamatsu, W., Nihei, Y., Yoshizaki, T., Yamanaka, S., Okano, H., and Suzuki, N. (2011). Modeling familial Alzheimer's disease with induced pluripotent stem cells. Human Molecular Genetics 20, 4530 – 4539. 16. Qiang L., Fujita R., Yamashita T., Angulo S., Rhinn H., Rhee D., Doege C., Chau L., Aubry L., Vanti W.B., Moreno H., & Abeliovich A. (2011). Directed conversion of alzheimer’s disease patient skin fibroblasts into functional neurons. Cell 146(3), 359 – 371. 17. Spires T.L., & Hyman B.T. (2005). Transgenic Models of Alzheimer’s Disease: Learning from Animals. NeuroRx: The Journal of the American Society for Experimental NeuroTherapeutics 2(3), 423 – 437. 18. Sturchler-Pierrat C., Abramowski D., Duke M., Wiederhold K.H., Mistl C. et al., (1997) Two amyloid precursor protein transgenic mouse models with Alzheimer disease-like pathology. PNAS 94, 13287 – 13292. 19. Ashe K.H. (2009). Alzheimer’s Disease: Transgenic Mouse Models. Encyclopedia of Neuroscience 283 – 287. Hey nice job so far! Don't forget to do a little editing of your intro, there are a couple spelling/grammatical errors. I liked your video and all the pictures! great work, i like the last part too where you linked everyone's pages to your page :) . Maybe you can make all the references in your figures to be similar to eachother and also link them to your bibliography? Hey Luisa! Great job on your page! I like how you broke down everything, making it easy to follow. And the video was also really helpful. Also, I changed the name of my page to "Genetics OF Alzheimer's Disease" (probably why it's not linking to it anymore where you have the section with all the links). I just thought I'd give you a heads up on that, because I think you'd have to re-link it (sorry! I didn't know that would happen).